St Mark's Square in Venice (Piazza San Marco) - cafes, pigeons and floods. How to get to St Mark's Square on foot and with a water bus. St Mark's Square in Venice is one of the most famous squares in the world. The two most important buildings on the square are the Doge's Palace and St Mark's Basilica. 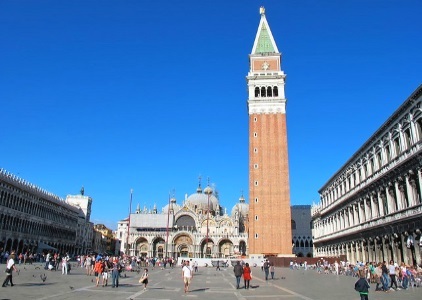 Another important building is the St Mark's Campanile, the landmark of Venice. The famous Canal Grande waterway flows into the sea not far from Piazza San Marco. Today the place is also famous for luxurious restaurants and cafes, pigeons and floods. St Mark's Square is 175 metres long and 82 metres wide. The place has an extension to the sea. This is called Piazetta San Marco. The square itself bears the name "Piazza" because it used to be the only fortified square in the city. The names of all other squares in Venice start in Italian with Campo (translated: field). St Mark's Square is one of the lowest places in Venice. It is one of the first places in the city to be under water during the frequent floods (Acqua Alta). Usually it is only a few centimetres. During extreme floods, Piazza San Marco or parts of it can no longer be entered. Acqua Alta is particularly frequent in winter. Footbridges for pedestrians are built at St Mark's Square during high water. There is always something going on at St Mark's Square. Watching people on Piazza San Marco is very popular with tourists. There are several famous cafes and restaurants, which are known for luxury and high prices. It is one of the most expensive places in the world, but also one of the most beautiful. Napoleon himself described St Mark's Square as "the most beautiful salon in Europe". Goethe was enthusiastic about the main square of the lagoon city during his journey through Italy. The square has been the centre of Venice for many centuries. St Mark's Square, the tourist centre of Venice, can be reached on foot in about three quarters of an hour from Santa Lucia railway station. A little faster are the water buses (Vaporetti), the only public transport on the island of Venice. St Mark's Square is (still) free of charge. However, there are plans of the city of Venice to charge an entrance fee for the square. The most famous coffee house on St. Mark's Square is Caffè Florian. Opened in 1720, it could be the oldest café in the world. It's a beautiful restaurant. The luxurious furnishings, the valuable paintings on the walls, the fine porcelain and the well-trained staff quickly make you realize that you are in a very special cafe. Some things reminded us of Café Sacher in Vienna. The prices in the Cafe Florian correspond to the luxury of the coffee house. A coffee (filter coffee) inside the café costs 15 euros according to the menu in the window, a club sandwich Florian 17 euros. The quality of the drinks and food offered in the Venetian coffee house Florian is always considered to be excellent. Goethe was already in Florian in Venice on his trip to Italy, as were Thomas Mann and Richard Wagner. Everyone praised Caffe Florian. We also think it is one of the best coffee houses we have ever been. There are several other cafés on St Mark's Square. Very well known is also the Gran Caffe Quadri on the other side. Here you get very good food. In the Quadri there are starters from about 15 euros. An excellent Lasagne Bolognese, which some guests remember all their live, is available for about 20 euros. Other main dishes, such as fish and meat, are not overpriced for around 30 euros. Some restaurants around St Mark's Square charge a so-called music surcharge or music surcharge for the live music in their café. This is about 6 euros per person. Unfortunately, we cannot say exactly where and when, as there was no music to be heard anywhere during our visit. We were at St Mark's Square in Venice on a winter day in the morning. By far the best known bar around St Mark's Square is Harry's Bar. It was for example the favourite bar of Ernest Hemingway, who lived in Venice for a while. The bar is located about 100 metres from St Mark's Square by the sea, near a ferry terminal (street: Calle Vallaresso). The drink that made the bar famous, or the drink that became famous through Harry's Bar, is called Bellini. A Bellini cocktail consists mainly of fresh peach and sparkling wine (prosecco, champagne). Enjoying a Bellini in Harry's bar is one of the great things on a holiday in Venice. Also near St. Mark's Square and very famous is the Hard Rock Cafe Venice. There are also some shops on St. Mark's Square in Venice. Most of them are noble jewellers and shops selling paintings and other works of art. But we also saw a nice little shop selling the typical Venice carnival masks (from only 2 Euro). It is a public square, open day and night. You can only enter on foot. Bicycles, scooters and other vehicles are prohibited. Police is present day and night. Since the many terrorist attacks in Europe also policemen with submachine guns. Sitting down or lying on Mark's square is also forbidden and can be punished with a fine. There are hundreds of pigeons in the large square of Venice during the day. They are fed, although forbidden, by tourists and locals. The birds are very used to humans. Some pigeons on St Mark's Square eat out of the hand of tourists or sit on the heads and arms of people. This is a very popular photo motif. More and more seagulls can also be photographed on St Mark's Square. They mingle with the pigeons. Among them are also very large gull species. The Italian name "Piazza San Marco" is used sometimes also in English. This film (less than 2 minutes) shows St Mark's Square and the important buildings in the area such as the Basilica of St Mark and the Doge's Palace Venice.